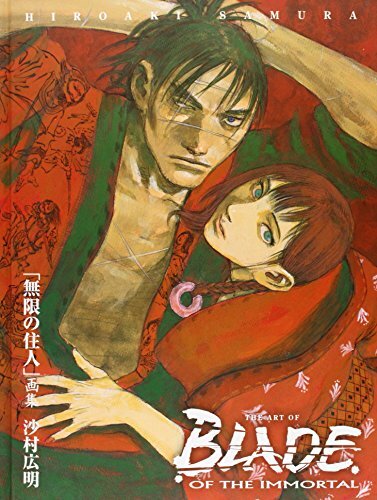 Hiroaki Samura's Blade of the Immortal epic is a unique, expertly paced manga series that mixes Edo-era samurai grudge matches with anachronistic punk attitudes and mannerisms. It's also one of the longest-running manga series in the U.S.! Samura's stirring tale of a warrior's search for redemption and a young girl's quest for revenge has taken the world by storm, winning numerous awards across the globe and spawning an anime series and a novel spinoff. In Dark Horse's The Art of Blade of the Immortal, Hiroaki Samura's lush color paintings, detailed line work, and selected story pages and chapter breaks are on display in an oversized, 9" x 12", hardcover collection. This Dark Horse edition also includes an exclusive section with thirty-two extra pages of artwork, an introduction by acclaimed artist Geof Darrow (Hard Boiled), and a translated afterword by Samura.